With hope that the national recognition will help to empower Nuu-chah-nulth communities, NTC President Judith Sayers has been appointed to the Order of Canada. Formally announced on Dec. 29, Dr. Sayers’ appointment represents one of the highest levels of formal recognition a Canadian civilian can receive under Queen Elizabeth II. Sayers has already received her Order of Canada pin in the mail, and awaits a ceremony this year where she will be recognized by Canada’s Governor General Julie Payette in Ottawa. Sayers was first informed of the recognition in early December. Membership in the Order of Canada is granted according to an individual’s dedication to their community and service to the nation. The order follows a biblical phase that states “they desire a better country,” a concept that aligns with Sayers’ history of indigenous leadership and advocating for cleaner sources of energy. Elected president of the Nuu-chah-nulth Tribal Council in September 2017, the mother of two’s professional experience includes 18 years of law practice in B.C. and Alberta, serving as elected chief of the Hupacasath First Nation for 14 years and acting as a strategic advisor for First Nations and corporations. Sayers has received an honourary Doctor of Laws from Queens University and is an adjunct professor at the University of Victoria’s Peter Gustavson School of Business and its Environmental Studies department. “She is the epitome of what it means to be an exemplary leader and advocate for all Nuu-chah-nulth people,” said NTC Vice-President Andy Callicum. 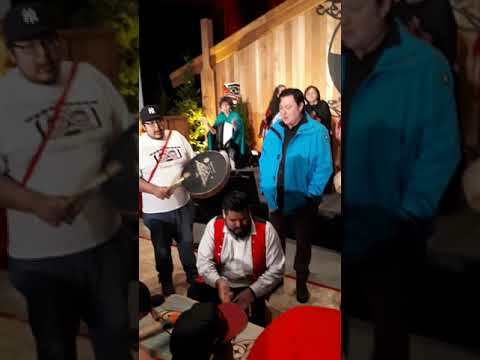 Before accepting this newest honour, Sayers admits she had to consider issues of contention between Nuu-chah-nulth and the Government of Canada. Some of the most immediate matters are if Canada will honour the Ahousaht et al. court case, which granted five Nuu-chah-nulth nations the legal right to sell fish caught in their territories, and how the federal government will adhere to the United Nations Declaration on the Rights of Indigenous Peoples. “I thought, well, if this is going to help me promote issues for Nuu-chah-nulth, it’s something that I should do,” she said. Over her political career Sayers has pushed for more regional power generation. While she was the elected chief of the Hupacasath, the band established the Upnit Power Project, a 6.5-megawatt run-of-the-river hydro station that has been operating at China Creek since 2005. Owned in partnership with Synex Energy Resources, the Ucluelet First Nation and the City of Port Alberni, Upnit has the capacity to power the equivalent of 6,000 homes at peak operation. A number of other First Nations on Vancouver Island and across B.C. have micro-hydro projects in development, yet currently the provincial agenda appears to be focussing on the massive Site C dam, a $9-billion project under construction on the Peace River in northeastern B.C. Site C is expected to provide power for the equivalent of 450,000 homes when completed in 2024, but will flood 9,330 hectares of farmland and First Nations territory. Advocating for smaller-scale hydro projects is part of the continual fight for First Nations to determine development on their territories, said Sayers. Despite common talk of reconciliation, she believes that the nation-to-nation relationships between Canada and its indigenous communities have regressed in some ways over the last generation - particularly under former prime minister Stephen Harper. As the role First Nations have in the future of Canada unfolds, Sayers emphasizes the need for Nuu-chah-nulth people to decide what they want the country to be.